Want to learn about the most recent highlights on the Devereux Early Childhood Assessment (DECA) Preschool Program, 2nd Edition? Click here to view a short video clip! To order the complete set of Songs of Resilience and/or other musical selections to promote resilience in young children, click here! 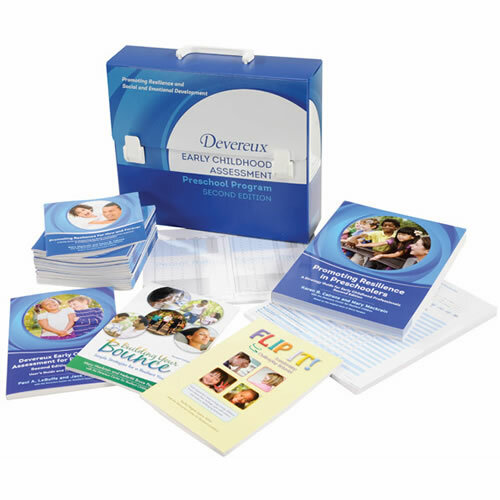 Devereux Early Childhood Assessment, Clinical Version (DECA-C): A behavioral rating scale that assesses both protective factors and behavioral concerns in children ages 2-5. Scales on the DECA-C include Initiative, Self-Control, Attachment, Total Protective Factors, Aggression, Attention Problems, Withdrawal/Depression, and Emotional Control Problems. While parents and teachers complete the rating, the DECA-C must be scored and interpreted by a qualified professional with training in test interpretation. Facing the Challenge (DVDs): This instructional, interactive DVD set includes more than two hours of training and documentary video, providing teachers with strategies for working with preschool children who display challenging behaviors. In addition to the rich video footage, the DVD set comes with a comprehensive trainer’s guide, filled with activities and guidance around using the videos for providing professional development to staff. Classroom Moments (DVD): Designed to enhance training, this DVD includes 28 video clips from early childhood classrooms, including clips that illustrate Prevention in Action, Positive Guidance, Learning Opportunities, Developing Observation Skills, and Case Studies. In addition to the video clips, this DVD also comes with a trainer guide for use in developing training and workshops for staff. FLIP IT! Transforming Challenging Behavior: This informative book by Rachel Wagner, in partnership with the Devereux Center for Resilient Children, is designed to support all adults who interact with young children. It explains FLIP IT!’s four simple steps for transforming challenging behavior in young children: F – Feelings, L – Limits, I – Inquiries, P – Prompts. Teachers and parents can help children learn about their feelings and gain self-control by using that mnemonic. Learn to FLIP IT! with the book’s practice pictures, reflection activities and real-life stories. If you have any interest in or questions about the following options, please reach out to Director of Professional Development, Debi Mahler, at [email protected]. This one-day training also offers more on the topic of challenging behavior in preschool children. Included in this training is more on what is challenging behavior, what is developmentally appropriate behavior, why do children misbehave, prevention strategies, behavioral planning, and intervention strategies. Video vignettes and case studies will be used to illustrate key points. Trainers will participate in an intensive, interactive session delving more deeply into the understanding of, prevention of, and planned responses to challenging behaviors in young children. This 2.5 day training session will highlight the Devereux Center for Resilient Children’s DVD resource, Facing the Challenge, as well as the best-selling book by Barbara Kaiser and Judy Sklar-Rasminsky, Challenging Behavior in Young Children, 4th Edition. Participants will leave this professional development experience with a standard one-day training and content that can be delivered in shorter sessions. Participants will also leave with the skills and resources to deliver the content to others who support young children. This two-day training is for individuals in the role of providing training and technical assistance to others on the FLIP IT strategy. Participant will leave this professional development experience with a standard one-day training and content that can be delivered in shorter sessions. Participants will also leave with the skills and resources to deliver the content to others who support young children. FLIP IT® is a strategy that offers a simple, kind, strength-based, commonsense and effective four step process to address children’s day to day challenging behavior. The four steps are embodied in the FLIP IT mnemonic which stands for F – Feelings, L – Limits, I – Inquiries, and P – Prompts. FLIP IT is nothing new, but transforms best practice into a strategy that is easy to remember, applicable in a variety of challenging situations and portable. FLIP IT teaches staff about four supportive steps that can be used to help young children learn about their feelings, gain self-control and reduce challenging behavior. When faced with challenging behavior, don’t FLIP OUT, just FLIP IT! This training can complement the use of the DECA Program or can be a stand-alone training.